Bariatric surgery refers to Plastic Surgery procedures for patients who have undergone significant weight loss (>50-100 lbs). These patients often experience loose skin as a problem after having the weight loss and are often quite discouraged despite their accomplishment. They may be interested in multiple procedures to address the breasts, abdomen, thighs and arms. While these procedures are described elsewhere on the website there are several specific caveats for this special group of patients. Firstly, any procedure should be delayed until completion of weight loss, ie achieving your weight loss goal. Secondly, not all of the corrective procedures can be performed at a single operation. Separate operations should be spaced out by approximately 6 months, at minimum. Thirdly, while some procedures may be covered by OHIP, this is not a guarantee after weight loss or prior bariatric surgery. OHIP may cover procedures if there are significant symptoms associated with the problem. As a consequence of having so much extra loose skin, incisions for the procedures on breast and abdomen often will require longer incisions than for other patients. In considering breast surgery after massive weight loss, most often a lift (mastopexy) is required, however some patients may still require a breast reduction while others may desire augmentation. Several options exist for discussion purposes during the consultation. Similarly for the abdomen there are multiple options. Some patients will be served well with a standard abdominoplasty (tummy tuck), while others may require an extra vertical incision (fleur-de-lis pattern), and others may request a circumferential abdominoplasty (otherwise known as a body lift). Various pros and cons exist. Regardless of the procedure, it is not meant as a weight loss tool, only to improve a patients self-esteem and quality of life. Post-operatively massive weight loss patients will often require drains in place for a much longer time than other patients, frequently >2 weeks duration. If drains are removed earlier there is a higher likelihood of seroma (a fluid collection occurring). This may require drainage with a needle on a repeated basis until it resolves. The skin will also loosen again after surgery, but to a much lesser extent. Pre-op for surgery on the chest and abdomen. 4 month post op view of gynecomastia surgery and abdominoplasty. 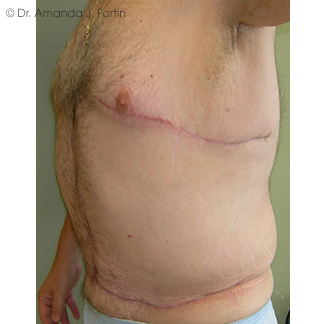 Who had had prior breast and abdominal surgery many years prior, then lost 100lbs. Preop for further breast lift and fleur-de-lis abdominoplasty. Post op view at 1 year. 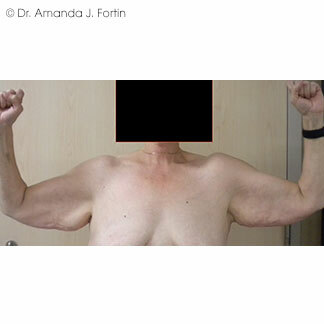 Brachioplasty is an ‘arm lift’. It addresses the loose floppy skin that can appear at the back of the upper arms, sometimes it is described as a ‘bat wing’. Liposuction can work for mild cases of this problem however most patients require the formal surgery which leaves a scar after removing the excess skin and fat. The scar will extend from the armpit down towards the elbow and tends to be visible. Many patients find this an unacceptable trade-off for removing the skin that they are trying to hide, thinking that they will then just be trying to hide a scar instead. Despite this it is a good operation whose main complication is slow healing and infection in the incision that is near the arm pit. Other complications include bleeding and numbness. Drains may be placed in the incision and will be removed when they are draining minimal amounts of fluid. Had removal of bilateral arm tissue Right side 174g; Left side 187g. A thigh lift addresses the inner upper area of the thigh which can have loose skin and extra fat naturally or more noticeable after weight loss. This surgery can be modified depending on the extent of the problem with either a scar horizontally (but below the bikini line) or extending vertically (ie down the thigh), sometimes all the way to the knee. The scar is a definite trade-off which may not be acceptable to some patients. The sensitive nature of the area of surgery usually requires an overnight stay after surgery as well as a few doses of blood thinners to prevent blood clots developing in the legs (DVT). Infection and wound healing are other common problems encountered with this procedure.